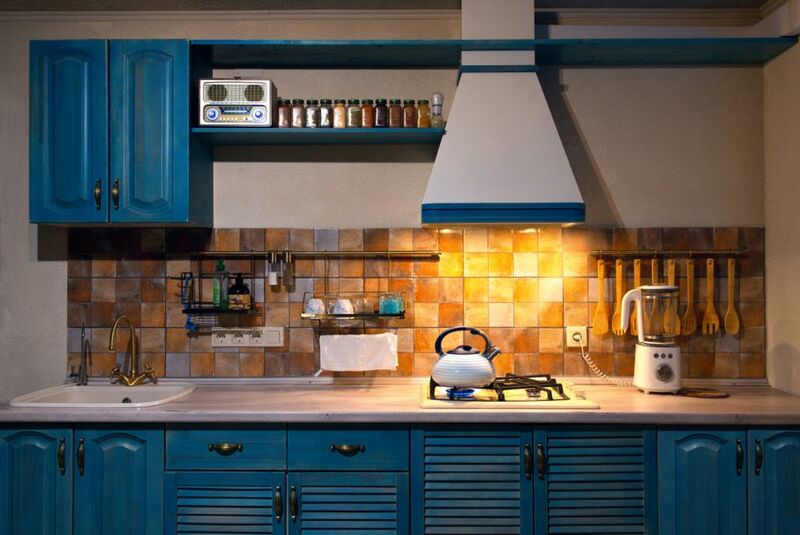 Cabinet stain colors can make a big impact on your kitchen. Discover how seven general stain tones will work with your kitchen's interior design. Interior design decisions like choosing paint, flooring, and cabinet stain colors, happen in an instant, but their effect on your room will last for years — sometimes even a lifetime. Nowhere is this truer than with your kitchen cabinets. Central enough to make or break your home design and expensive enough not to be switched out if you mess it up, kitchen cabinet stain colors must be picked with care. Because of the power and longevity of this choice, it’s important to know more than just "what you like." You need to understand how stain colors work with the other elements in your kitchen, especially its design style. 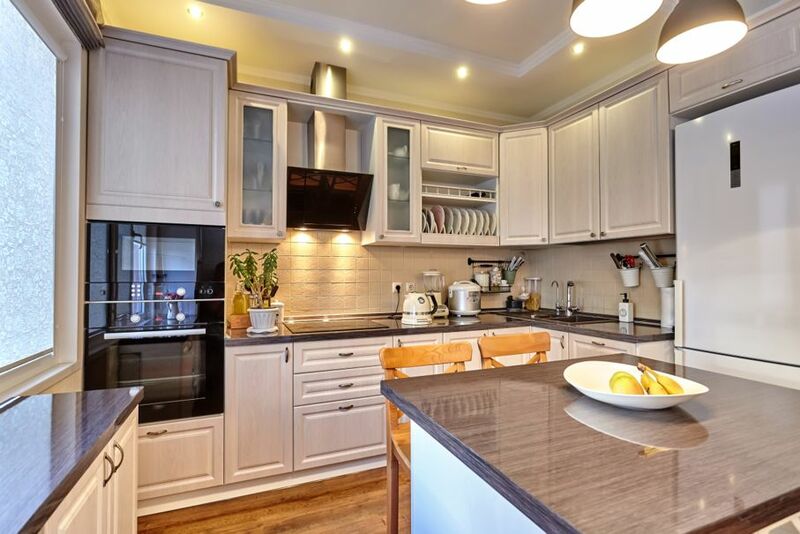 Here are seven general groups of popular kitchen cabinet stains and tips on how they interact with other kitchen design elements. Blonde stain tones are most often associated with oak or pine cabinets. Because of their link with these traditional wood types, blonde stains will generally have an equally traditional look in your kitchen. If you like this color palette but have more modern tastes, you can bring this stain tone up to date by applying it to flat-fronted cabinets. If you use this stain on paneled cabinets, however, you’ll end up with a more classic kitchen. Dark brown cabinets are more current than blonde. 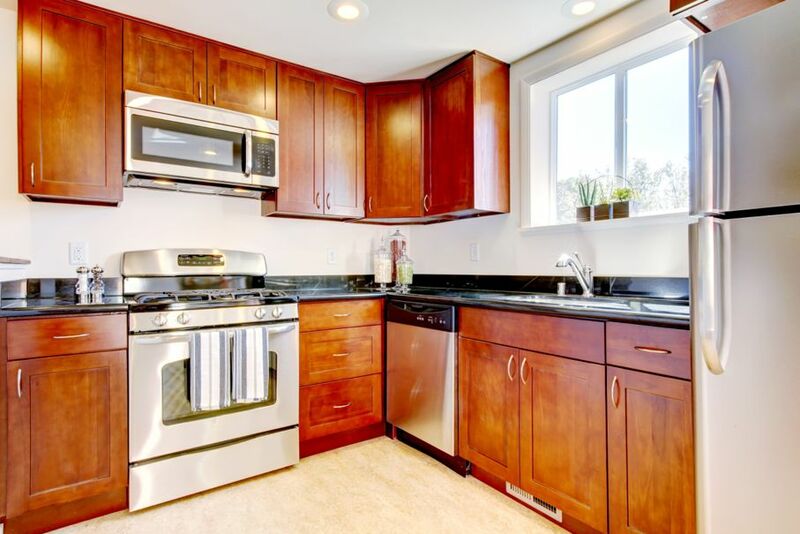 Because of their strong contrast with popular stainless steel appliances, they can create an eye-catching kitchen. 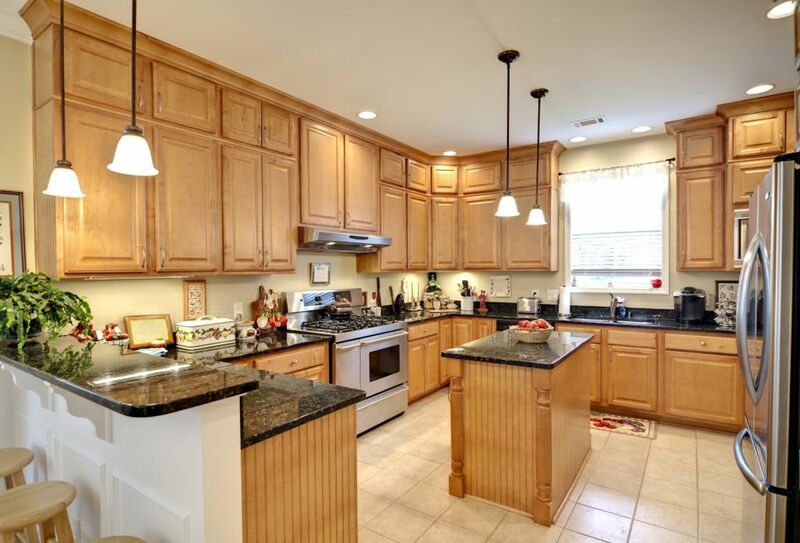 Dark brown cabinets, however, need space to play in. Using this cabinet stain color in a small area will make your kitchen seem small, dark, and dreary. No matter the size of your space, it’s wise to choose this darker stain color only if your other large-scale design elements, like paint and tile, are lighter neutrals. 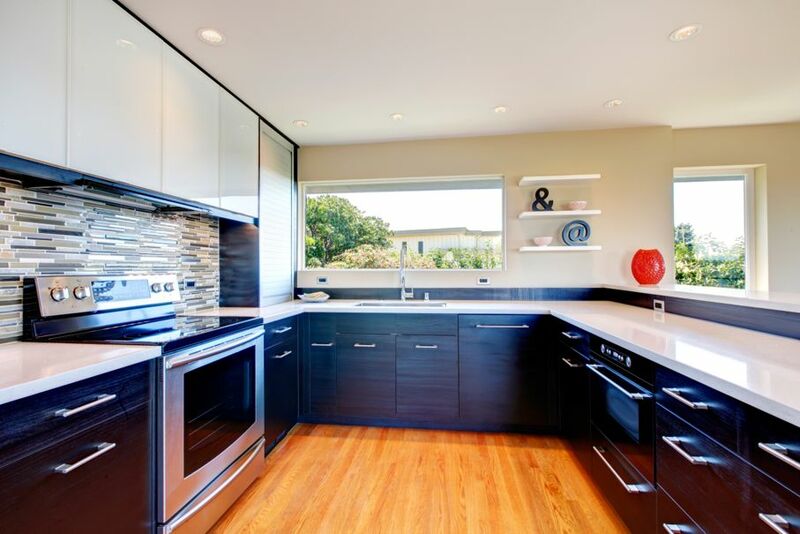 Like dark brown stains, black stains are a good fit for a modern kitchen. Also like dark brown, black-stained cabinets contrast well with stainless steel, but they’ll make a small room look even smaller. One way to counter the latter issue is to split your cabinet colors. Use black stain for your lower cabinets and choose a lighter or brighter color for your upper cabinets. Because black is a hearty neutral, it works well with bold colors, but it’s just as striking as white or beige. White stained kitchen cabinets are a good match for you if you love the appearance of wood grain, but you want the look of clean white painted kitchen cabinets. White stain colors are optimal for small spaces. White, of course, will get along well with any appliance color. However, if you want to avoid a boring kitchen, be sure you add contrast to the space via darker countertops, flooring, or paint color. Gray stained kitchen cabinets are the mediators of kitchen design styles. 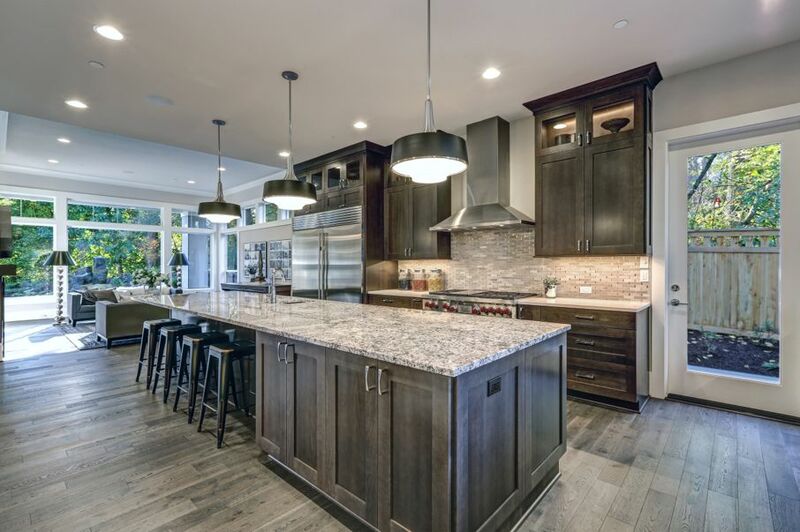 When combined with flat-fronted cabinets and paired with industrial-style light fixtures, gray stained cabinets will give you a high tech or an avant-garde design, and, it's even among the colors that go with teal. If, however, you use a more conventional cabinet style like a plain Mission style, for example, and you give your cabinets a gray stained floor and other rough textures like salt and pepper granite as companions, gray stained cabinets can go country, or even rustic. Cherry stained cabinets are perhaps the most traditional of the cabinet stain colors. Often used in grand kitchens, cherry red cabinets can have almost an Old World character. If you don’t live in a mansion, however, cherry red stained cabinets can still find a place in your kitchen if you stick to clean lines in your cabinets and countertops. Because of their red undertone, this stain color needs neutrals around it. It will work fine with white, black, or stainless steel appliances. If you love color but you don’t want to paint over the beauty of your cabinets’ wood grain, colored stains are the way to go. Many cabinet stain companies are now offering a wide variety of colored stains. You can choose anything from pale yellow, which can give you a more up-to-date version of the blonde stains discussed in the first section, to bolder shades like red and blue. 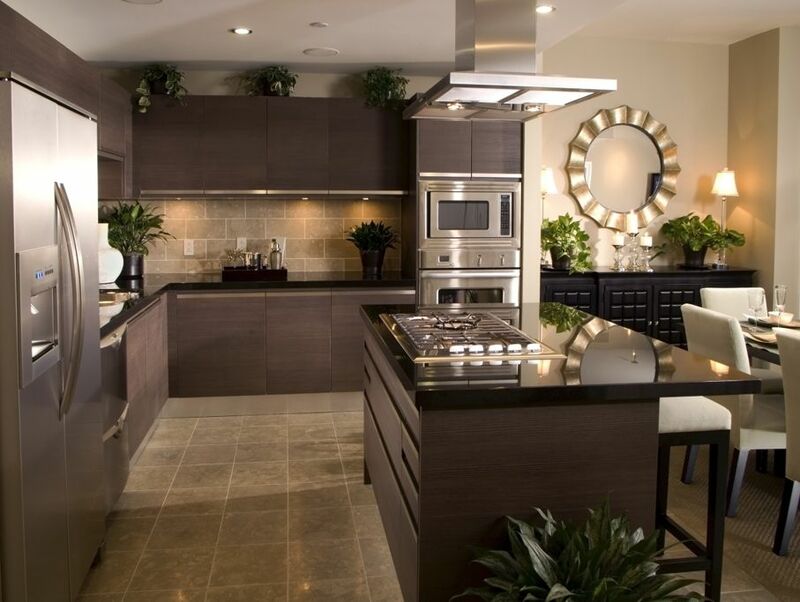 When you choose strong cabinet stain colors, its best to give them a backdrop of neutral wall and countertop colors. Let the cabinet color rule the room. You can get almost any room styling with these colors, depending on what type of cabinets you cover with the stain, from modern to country. The above seven cabinet stain colors are not by any means a complete look at what stain choices are available, but they cover the general groupings. When you keep in mind how these color groups interact with the design elements around them, you’re sure to pick the best cabinet stain colors for your space.